Want to know if water ballast really makes your glider go faster, or how to spot the best thermalling days? 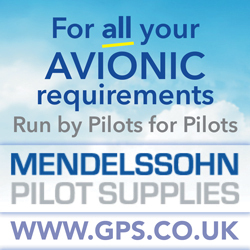 You can find the answers in the Feb/March issue of S&G, which also includes evaluations of the Silent 2 Electro ultralight glider and the LX Zeus nav system. 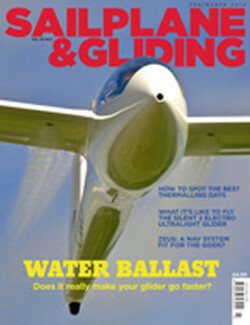 Water ballast is probably the most talked about way of making your glider go faster. Tim Macfadyen looks at thebenefits of adding water to a variety of gliders, how to decide the amount of ballast to put in, and some of the other factors that govern your cross-country speed. If you’ve taken a day off work to fly, it is by definition ‘a good day’ and you will probably fill with water, ignore 2kt thermals, take the 4kt ones and go fast. But are you able to spot the best thermalling days? Reading the vagaries of the British weather is a major challenge. If this is a skill you are still acquiring, take a look at the top tips from two leading coaches on how to improve your forecasting accuracy. It was certainly a good day for Paul Conran when he found himself at the controls of the Silent 2 Electro in the beautiful setting of Ireland’s Dingle peninsula. It’s one of a new generation of self-launching ultralight gliders with a max all-up weight restricted to less than 300kg. The BGA will be working with the CAA on the introduction of nationally registered ultralight sailplanes and ultralight powered sailplanes in the UK. The Silent 2 Electro operates successfully at gliding clubs elsewhere in Europe; perhaps it won’t be long until it is also seen in the UK. The LX Zeus is a navigation system that has impressed many pilots since its launch. European Club Class champion Roman Mracek used the LX Zeus during the European Gliding Competition in Ostrów, Poland, when it was installed in his Standard Cirrus. He says that this high-end vario navigation system with IGC approved flight recorder will suit not only competition pilots, but also fairly inexperienced cross-country pilots. Also in this issue: Tim Scorer offers top legal tips on insurance policies for pilots, gliders and more. 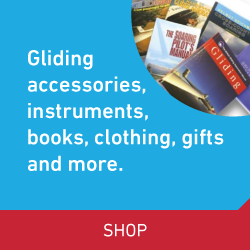 Pete Stratten reports that the BGA now has a library of UK gliding books and magazines online, thanks to Wally Kahn and Peter Redshaw. Jake Matthews’ photographs illustrate some of the stunning Cornish scenery seen during flights from RNAS Culdrose. Steve Pozerskis reports on the iFly scheme, which aims to provide a path to a career in aviation and introduce more young people to gliding. Ed Foxon describes the benefits of the two-seater training run alongside the Junior Gliding Championships. John Williams reflects on his UK 400km triangle speed record flight in December. We report on the 2013 Club Management Conference. John Wright reviews the FAA glider flying handbook. Bruce Stephenson introduces a series of articles on the pitfalls and rewards of restoring wooden gliders. Hugh Woodsend looks at the lessons we can learn from recent Airprox. Last, but not least, there are many more of your stunning images in the Gallery pages. A nav system fit for gods?